You are currently browsing the The Pet Product Guru blog archives for the day Saturday, December 8th, 2012. Your cat may have a thick coat of fur but that doesn’t mean that she is fully protected from winter weather. 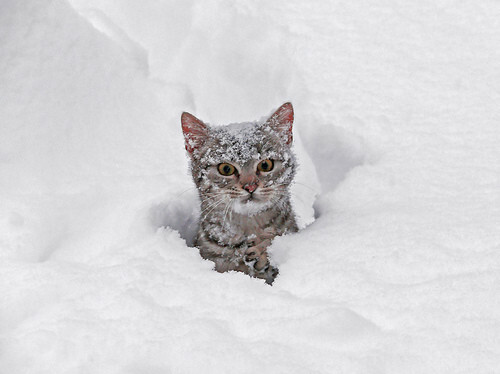 Snow and cold temperatures can be dangerous to your cat especially when the snow is higher than your cat’s shoulders. If your cat is used to being inside, a sudden cold snap could lead to hypothermia. Frostbite can also occur. It’s safest to keep your pet indoors. If you do decide to let your cat out to play during winter, slowly acclimate him to the cold. Make sure he has a warm, safe shelter as well as plenty of food and water. If you do suspect that your cat has frostbite, soak his extremities in warm water and then take him to your veterinarian.